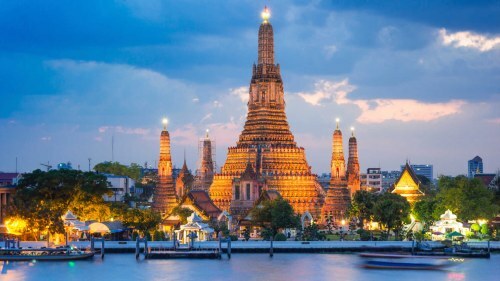 United Airlines and ANA (All Nippon Airways) have dropped the price of their flights from Edmonton to Bangkok, Thailand down to between $525 and $609 CAD roundtrip including taxes. This is a new record for the cheapest flights from Edmonton to Thailand. Obliterating the previous record that was just set a few months ago! NOTE: After your Flighthub search completes, click on 'Flexible Dates' to see more dates for $514 to $568 CAD roundtrip. This option is not available on the mobile site. - For the first and third flights, try using dates that are the same as the cheap dates you found for a regular roundtrip flight on Google Flights. Update 1/11 @ 4:45 PM MST - There are quite a few Edmonton - Bangkok flights in May and June showing up on Momondo for $527 to $577 CAD roundtrip. 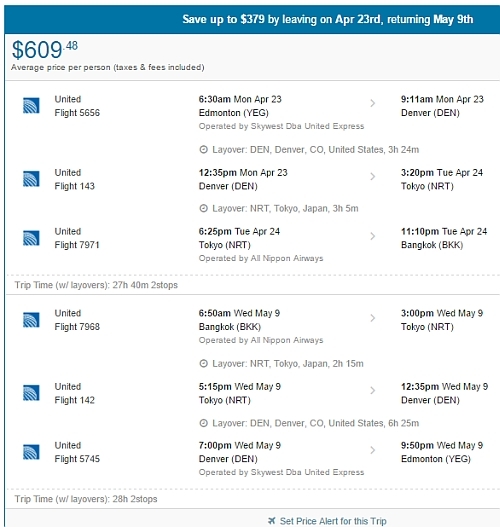 - You can also find the multi-city 2-in-1 trips (Thailand and Japan) through Momondo using the same technique as described for Flighthub above. - look for the dates that are $530 to $580 roundtrip. NOTE: After your Momondo search completes, you may want to slide the 'Max Flight Duration' slider on the left down to about 55. NOTE: After your Momondo search completes, you may want to use the Max Flight Duration slider on the left, to filter out really long flights. Edmonton to Bangkok, Thailand - $738 to $798 CAD roundtrip including taxes | new record! 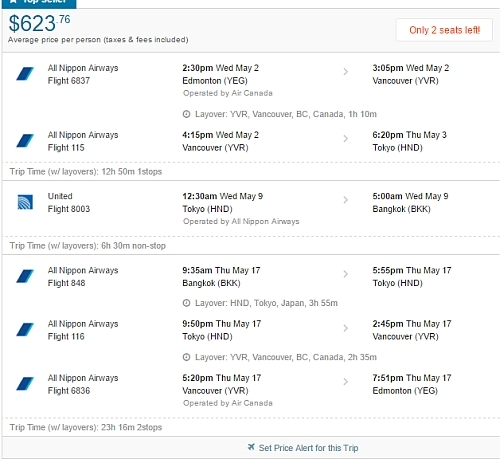 edmonton, yeg, flight deals, asia, bangkok, thailand, bkk, southeast asia, united airlines, ana and all nippon airways. No Responses to "Edmonton to Bangkok, Thailand - $525 to $609 CAD roundtrip including taxes (new record!) | add Japan for $100"